When the Israeli government and military launched its latest assault on Gaza yesterday, November 14th 2012, by killing Hamas’ military commander, Ahmed Jabari from the air, it indicated it was ready for a sustained campaign by giving it a codename. Curiously, though, its name in Hebrew, “amud anan” which refers to the biblical term “pillar of cloud”, has been translated to English as “pillar of defense.” The difference in name indicates that the Israeli authorities are hoping to win the battle over the image of this war, unlike “Operation Cast Lead” in the winter of 2008-9. “Cast lead” sounds ominous in English, though it is a phrase taken from a poem by Chaim Nachman Bialik, one of Israel’s national poets, to mark the festival of Chanukah which coincided with the war. So, the image managers of this war are avoiding using what they take to be an internal, Israeli Jewish cultural association that might be “misunderstood” abroad, and might thus contribute to international condemnation of the Israeli military action against Hamas. Yet, the phrase “pillar of cloud” is hardly an unknown expression in English and in Western culture generally, as illustrated by William West’s painting, just as the Bible is somewhat more widely read around the world than Bialik’s poetry. Appearing first in the story of the Children of Israel’s exodus from slavery in Egypt, the crossing of the Red Sea in which Pharaoh’s army pursuing them was drowned, and their long journey through Sinai, the “pillar of cloud” symbolizes divine leadership of the Israelites’ progress. “And the LORD went before them by day in a pillar of a cloud, to lead them in the way; and by night in a pillar of fire, to give them light; to go by day and night” (Exodus 13:21). An Israeli military spokesperson quoted on the Gawker blog states that: “The name is not a direct, word-for-word translation. Like most translations, it is an attempt to convey the spirit of the name, rather than a simple Google Translate.” One wonders whether the spokesperson is unaware that the Bible has been translated into English for centuries, or whether the image managers belatedly realized that the brand name for the war was open to “misunderstanding” once again. Indeed, the Gawker has already interpreted the choice of Hebrew and Biblical name to mean that “Israel Names Its New War After Biblical Story About God Terrorizing Egyptians,” on the grounds that the divine pillar threw the Egyptian army into confusion so the Israelites could escape. The codename perhaps has been (mis)translated deliberately by the Israeli military to cloud the negative connotations that the “pillar of cloud” has. But the (mis)translation follows a deeply rooted cultural logic in Jewish Israeli, Zionist collective existence. Jewish Voice for Peace also condemns the choice of codename, but on the grounds that “it is unseemly to invoke the protection afforded the Israelites wandering in the desert when Israel is the dominant military power in the region”. The Israelites had no army when they fled Egypt, afraid and unsure of their path. But surely, now that Israel has such a powerful military, as the Israeli broadcast media were quick to boast in their cheerleading of the assassination of Jabari and the allegedly precise strikes on the Fajr missile sites, today’s people of Israel do not feel dependent on divine protection and leadership? In choosing a codename that figures Israel as in need, still, of divine protection, the military image makers express, from behind a cloud, a deep felt need for a Jewish Israeli public to continue to see itself as defenceless despite its strength. True, the image makers’ have an explicit imperative to present this war as a military operation in which Israel is forced to defend itself against an implacable enemy, Hamas, that both targets Israeli citizens and exposes its own people to the harm of Israeli retaliation. That is certainly part of the motivation behind the mis(translation), part of the propaganda campaign to erase Israeli and global awareness of repeated Israeli initiation of armed attacks on Gaza, part of the legitimation of a regular pattern of “little” wars, each of which is “successful” only in so far as it is repeated, as Hagai Matar has pointed out. “Cloud” is (mis)translated as “defense” because it does not matter how much military power Israel has, nor how victorious its armed forces, nor how precisely its intelligence and weaponry can target its enemies, it will not be enough to fill the felt need for protection, for defense. All the military manna in heaven could not fill that hole. The pillars of smoke and fire that the Israeli military inflicts on Gaza by day and by night are a substitute, though a poor one, for divine protection and presence. The pillars of smoke and fire are clouds that instead of leading today’s Israel towards a promised land lead us to repeat, compulsively, acts of war that bring not peace but situations such as the unilateral withdrawal from and siege of Gaza that demand never-ending military “defense.” The pillars of smoke and fire that cloud our hopeless, mournful, traumatic and traumatizising repetition of violence condemn Israel to wander in a wilderness of war until we can see through the clouds of war that only a pillar of peace will dispel the felt need for divine protection and defense that we seek, vainly and profanely, through the force of arms. 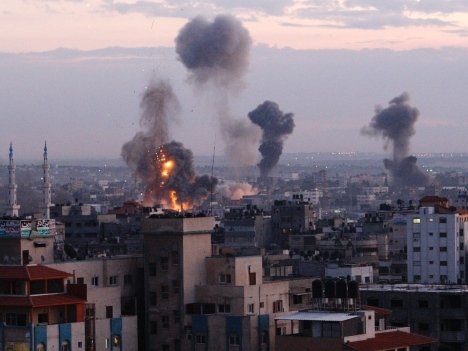 This entry was posted in Anti-occupation, anti-war, Uncategorized and tagged Gaza, Israel/Palestine, middle-east, Operation Cast Lead, pillar of cloud on November 15, 2012 by Jon Simons.